Our soft, 36" square blankets are sure to be a favorite. We've just lowered the price to make them even easier to add to your Brooke's Line gift giving. 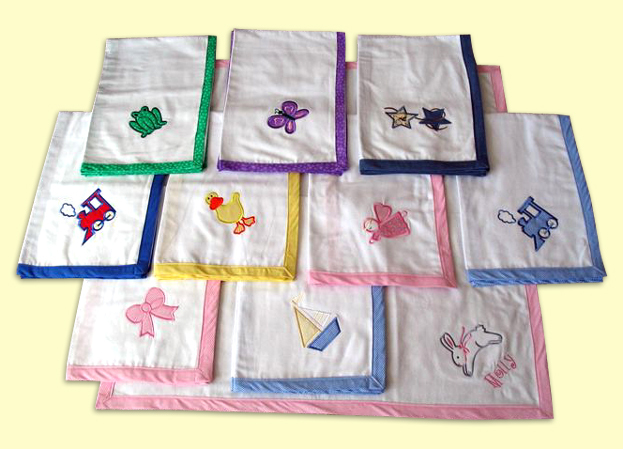 They are the perfect weight to be used to cover baby in air conditioning or on cool days for extra bundling. They are made of lightweight cotton flannel, trimmed in coordinating 1" bias and have one of our beautiful appliqués in the corner. Add baby’s name monogram for a special touch!